Bring home a piece of elementary school nostalgia with the Baden Champions Series Tetherball Set. This portable regulation size tetherball set comes with everything needed to bring home a piece of the school yard with you. 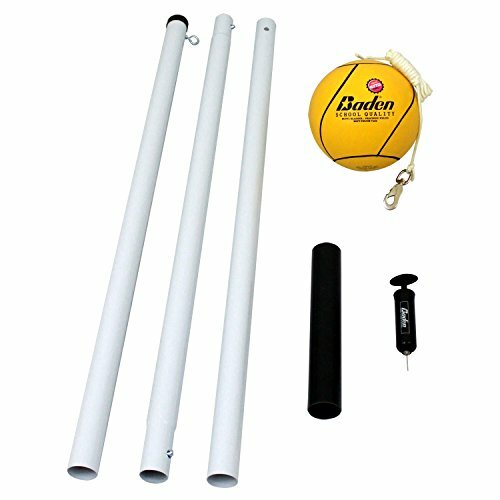 This backyard game set comes packaged with a detachable white steel powder-coated pole which stands fully assembled at (10’ 5”), (1) 100% rubber school yard quality tetherball, an air pump with needle just in case you need to top the ball off, a durable nylon rope and eyebolt that quickly attaches to the pole, and a (12-inch) ground sleeve that will ensure your tetherball set stands confidently even during the most spirited games. This set can also be secured with concrete, inside a tire for added portability, or again in the ground with the provided ground sleeve. We here at Baden strive to produce the highest quality yard games on the planet and we have spared no exception to this tetherball set. If you’re looking to bring home some a quality backyard game look no further.